When we were choosing the films we'd watch in every state, much thought and research went into choosing the film for Oklahoma. So, I'm imagining the surprise and jaws a'droppin' when you learn we went with Oklahoma! The 1955 musical is as corny as an elephant's eye (I think that's how the lyrics go) but it still is fun, and it has a classic score. Very talented people were involved, though the star, Gordon MacRae, did very little else that anyone cares about. The director, Fred Zinnemann, won two Oscars (for From Here to Eternity and A Man for All Seasons), and Shirley Jones and Rod Stieger went on to win Oscars as well. 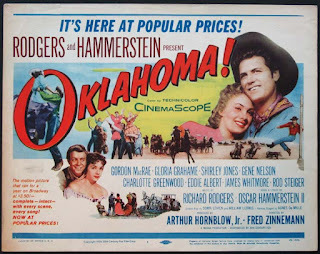 The real disappointment was to discover that the film was not filmed in Oklahoma but rather in Arizona (and California studios). But that's OK. There are other films that use the state name in the title. There's Oklahoma Crude with George C. Scott and Faye Dunaway. But I haven't seen it. There's The Oklahoman, a western with Joel McCrea, but I haven't seen it either. Someday I must see The Oklahoma Kid with the most incredibly unlikely Western stars, James Cagney and Humphrey Bogart, but I haven't yet. And none of them were actually filmed in Oklahoma. I have seen Hang 'Em High, one of Clint Eastwood's first American-made Westerns, which is set in Oklahoma. But not filmed there. I've also seen Cimarron, the Western that won the 1931 Oscar for Best Picture. It also is set in Oklahoma but not filmed there and is boring as can be. To find films set in Oklahoma and actually filmed in Oklahoma it's best to go to the world of juvenile fiction. Where the Red Fern Grows, based on the classic children's novel, is set and was filmed in Oklahoma (primarily Tahlequah). Several works by adolescent author S. E. Hinton were set and filmed in Oklahoma. You might wonder if the phrase "adolescent author" means a young author or an author who writes for young people. Both definitions apply to The Outsiders, which was written while the author was still a teen. Francis Ford Coppola (of The Godfather fame) adapted the novel to the big screen (as well as Hinton's Rumble Fish). And Disney adapted her novel, Tex, as a feature. 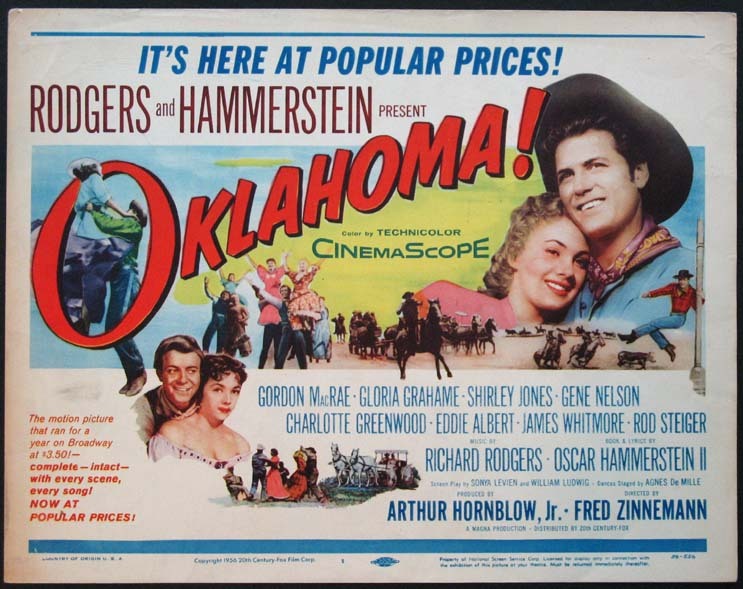 All three films were set and filmed in Oklahoma. But perhaps the greatest film set and filmed in Oklahoma is the masterpiece written by the great "Weird Al" Yankovic. 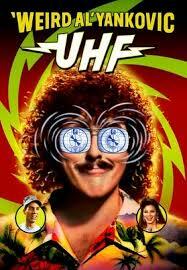 Sadly, UHF still awaits the critical appreciation and public adoration it deserves.